Paul is the Principal Broker in Utah County and manages a team of real estate agenst who help him sell homes in Utah County. Paul graduated from BYU in 1995 and has been in the top 1% of volume Real Estate sales and experience for many years. Paul previously owned and opereated a local ReMax with a few other partners. Paul has sold over 1,100 homes in Utah County in the past two decades. Hiring an experienced Realtor is very important. I have seen many agents leave money on the table when negotiating, because they don't know how to raise or lower a price. I will protect your price and get you the most money for your Utah County home. 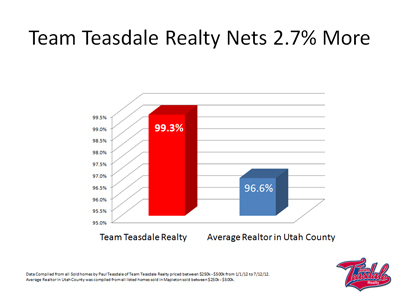 Team Teasdale Realty nets their clients 2.7% more money than the avearage Realtor in Utah County. This means our team will net our listing client $5,400 more on a $200,000 home compared to your average Realtor in Utah County. Paul has been working with the Agents in Utah County since 1995 and has built a reputation of being honest, fair, and hard working. Paul has built relationships with the other top producing Agents and Brokers in Utah County. These relationships can be very useful when negotiating a sale. For example, a few weeks ago Paul was competing on an offer with another buyer's agent to buy a home in Saratoga Springs. The other Agent came back and told Paul that the prices were the same, but decided to accept Paul's deal based on his reputation. Getting along with other Agents and personally knowing the top producers makes a difference. When you hire a real estate agent hire a Principal Broker in Utah County. Paul Teasdale earned his CRS designation about fifteen years ago. 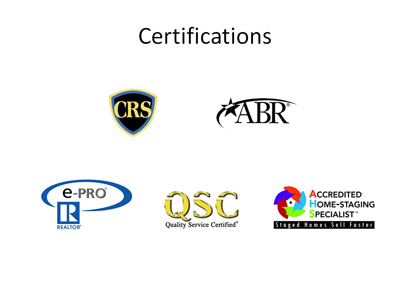 It is called the Certified Residential Specialist Designation. It is an intensive training program that trains Realtors to become better Agents. Paul has earned his Accredited Buyers Representative Designation or ABR. He also earned his e-PRO designation. This training consists of special Real Estate internet education. QSC stands for Quality Service Certified, and the AHS is an Accredited Home-Staging Specialist. This one was earned by my Associate Broker, Dave Teasdale. Dave specializes in helping you stage your home and helping you prepare your Utah home for showings. Hire a Principal Broker in Utah County to help you sell your home.